"Just a small amount of ingredients, but you will be shocked at the amount of flavor in this dish!" Heat a large skillet over medium-high heat. Add sausage; saute until lightly browned, about 3 minutes. Add onion and garlic; saute until the onion has softened and turned translucent, about 5 minutes. Add cabbages season with salt and pepper. Cook and stir until cabbage is translucent and limp, 6 to 10 minutes. 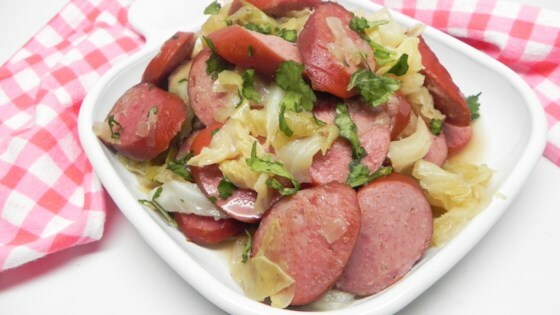 Dinner's on the table in no time with this one-skillet sausage and veggie dish.